I liked the idea of this, and the execution was mostly good, but I felt like the story started dragging at about 54% and didn't really pouch up again until almost 70%. Ultimately, I liked that Gunnar and Liam were able to find their HEA, and that all of the conflict in the story was satisfactorily resolved. Definitely worth reading. I loved all the characters. 3.0 out of 5 starsTwo good men who find another chance at happiness. A little bit of telling rather than showing, but overall a great read. Gunnar and Liam both have an opportunity for a second chance at love. Neither think they're ready or willing for that kind of connection but things in life never go according to plan. An early morning visit to the vet brings Gunnar and Liam together but it'll take determination, moving forward from the past, and a precocious eight-year old little girl to keep them together. Oh, and catching a killer that may or may not be after Liam. There's quite a bit of self-doubt and self-flagellation going on under Gunnar's strong, capable, alpha persona. I can understand his thinking and feel for him. I'm glad, though, that he allows himself to feel the connection to Liam and somewhat quickly gives in to the pull. There's an intense draw to the man that I would have been disappointed if he followed the oft-used tactic of hiding behind a dead lover to keep from finding happiness after loss. It's absolutely normal, healthy, good even to fully grieve before entering into a new relationship after losing a loved one. I think, from what we learn of Gunnar, that what he really has to conquer to fully accept a new love is his own feeling of failure and not his loyalty or love for his deceased husband. Ultimately it's his decision to accept what he could have with Liam that pushes them forward into the kind of relationship they can build a forever on. With Liam it's a bit different. He has personal trauma that's much more sinister that tries to follow him into his new life. His days are filled with helping others, helping their animals, and fear. He's doing his best to move forward but can't shake the terror that his past will find him. 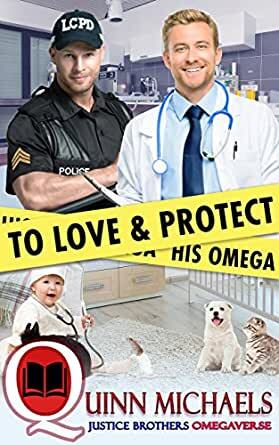 When he meets Gunnar he's determined to squash his attraction but it's Gunnar's earnestness, his daughter, his innate ability to calm and soothe Liam's fear that convinces him to give in. The chemistry between the men is pretty steamy. I enjoyed their interplay and that their relationship felt equal. There was the usual omega submission thing, but not to a level that seemed archaic, rather one that let their true selves come forward. By allowing their vulnerabilities to show both in and outside of the bedroom they could fully support one another. Liam stood next to Gunnar in every way, a united front full of give and take. It was also clear in how Gunnar expressed his worry but wasn't overprotective and Liam didn't stubbornly push back against any posturing. This came in handy when things went pear-shaped. Liam's past does, indeed, catch up with them and it ramped up very quickly. There was a lot of plodding in that regard and I wasn't sure if it would ever get to the point. Instead, it was very few details and more set-up followed by a huge confrontation and a quick resolution. While that was okay, I do wish there had been something more direct, active, or harder-hitting in terms of how the plot progressed. I don't mean more dangerous things happening or anything like that, just for the plot progression to feel more dynamic rather than static. It felt like the story gave a TON of detail but didn't really move forward very quickly, well, except for the timeline of the romance...that was pretty quick. Overall, though, the story was a good one with passion, tenderness, and growth. I've waited a long time to read this novel. Quinn Michaels teased us for weeks & weeks. I refused to read the except - I wanted the whole thing and it was more than worth the wait. I even preordered it through the author and finally the release date arrived. As a an animal lover and criminal justice graduate, I love law enforcement and veterinarian stories. Pet ownership is an extra plus. This book had all these things and more: a widowed Dad, a precocious little girl, a scared young man who had run away from a stalker. A cop who felt like a failure & feared he'd let down his husband, his daughter, and murder victims. An Omega who jumped at every shadow because he'd been abused by his predatory boyfriend. Self esteem issues made him stay longer than he should have and despite all signs pointing to trouble. How could he allow himself to get close to anyone else again when he obviously had such poor judgement? An Alpha pressed down so hard by grief he could bearly breathe. His grief was all encompassing, clouding his thinking, and ability to see what was right in front of him. Compound that with problems at work & he was an Alpha powder keg. A serendipitous meeting due to a sick kitten and suddenly he started breathing again. Plotting, planning how to get this animal doctor out of his white lab coat (and other clothes). A young girl floundering, also grieving, striking out because of bullying and loneliness. A patient matchmaker makes a huge difference in her life. A father of a happier girl and he's noticeably not walking around with a black rainy cloud over his. A frightened man suffering from sudden panic attacks needs patience, reassurance, and understanding. This full length novel was entertaining, emotional, suspenseful, and initially a slow build-up. There are so many reasons for the main characters not to be together, but they fill each others empty needy spaces. And there's that thing about both loving pets and children. I will be rereading this book again, especially with it being the first in the new Justice Brothers series. I am eager to see what the author does with the next sibling and what will his story entail? If you love mpreg, angst, a murder mystery, little girls, and a variety of pets you need to read this book.